Tiger Muay Thai & MMA, Phuket, Thailand is proud to announce that TMT trainers Kru Yod and Kru Lamsonkram have been personally invited to Canada to train the UFC’s Georges St. Pierre (GSP) for his upcoming fight against Carlos Condit at UFC 154 in Montreal on November 17th. After spending more than a year on the sidelines with his injury, the UFC Welterweight Champion’s return to the Octagon is hotly anticipated. 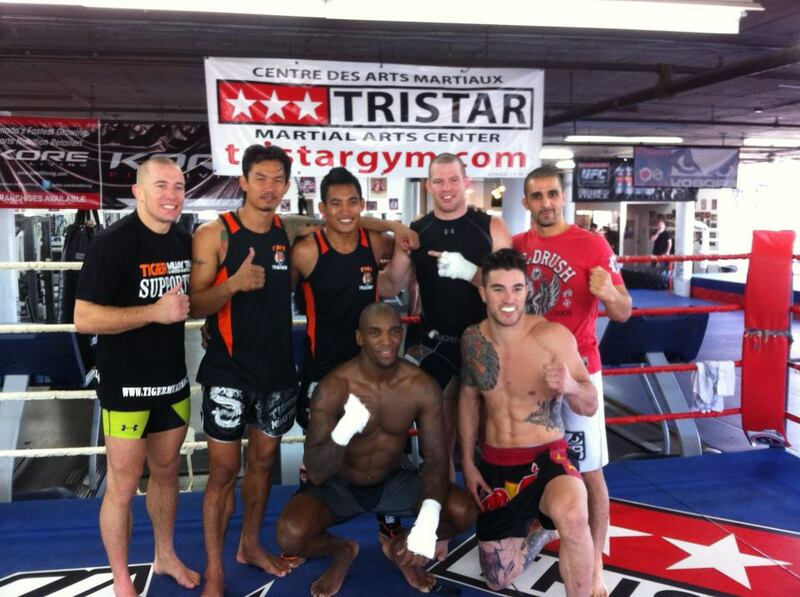 Kru Yod and Kru Lamsonkram arrived in Montreal yesterday (Oct. 18th) for this awesome opportunity! They begin training GSP TODAY! As two of Tiger Muay Thai’s top trainers, we are excited to see them work with GSP! Stay tuned for training photos and footage as they rock our latest Tiger gear. Yod AKA Wilek Sornnon has been teaching on and off at TMT for 7 years and has traveled to Sweden, Finland, Japan, and China on teaching expeditions. He is one of Tiger’s most popular trainers. Yod has over 280 fights and captured the Bangla and Patong titles, along with the PK-1 Championship. Lamsongkram AKA Suphachai Jansod is the current Rajadamnern Middleweight Champion and has over 170 fights. He started training at eight and has won a total of six championship belts. He has taught in various countries including Japan, the USA and England. A professional fighter favorite, he has worked with competitors from around the globe. Thank you, GSP! Training pics and footage to follow!